How David Beat Goliath. Georgians United Defeat SB469. February 22nd, 2012. Word got out about the frontal assault of SB469 on the people of Georgia. February 29th, 2012. Community allies and Occupy Atlanta held a rally with about 75 in attendance at the capitol to highlight SB469, Senator Balfour (introduced the bill) and the American Legislative Exchange Council (ALEC) that crafted the bill). March 2nd, 2012. Jobs with Justice exposes Senator Balfour as a Vice President of Waffle House. 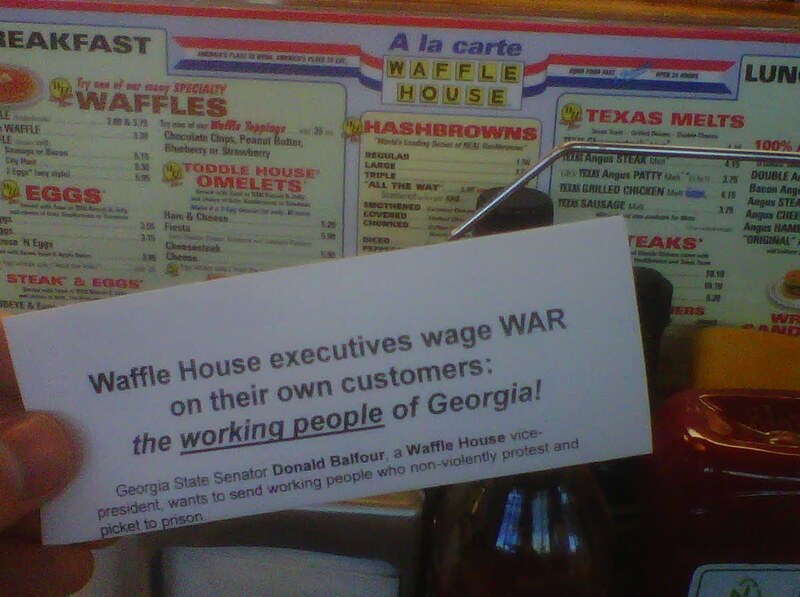 7 Waffle House locations are targeted in Metro Atlanta and Snellville (Balfour's District) with fliers informing customers that Waffle House Execs are attacking Georgians right to free speech. It was noted during this outreach that Georgians of all stripes -- including tea party folks -- were against this bill. March 5th, 2012. Georgia AFL-CIO, local unions and community partners organize a rally at the GA capitol against SB469. About 300-400 were in attendance. The rally spontaneously marched to the closest Waffle House and held a huge picket in Balfour's honor. Servers inside the Waffle House were tipped heavily so they know that no community angst was directed towards them. March 13th, 2012. 1st Mass Community Meeting was held to discuss collective strategy to stop SB469. Over 75 folks came to this meeting and almost 40 organizations were represented. The infrastructure for a large act of civil disobedience including bail funds and civil disobedience trainings began at this meeting. This meeting helped to build the largest Labor/Community mobilization we have seen in Atlanta in years. March 17th, 2012. Mass Mobilization with 2,000+ in attendance. Labor came out big as well as the Georgia Latino Alliance for Human Rights and other community allies. It was great to see an undocumented student sharing her story with thousands of trade unionists. This is when we broke through the media bubble and took control of the narrative around SB469. It was critical to change the perception from a "bill that would stop union thugs from targeting private residences" to "a broad coalition of Georgians standing up for our 1st amendment rights and for working families." Community members contributed over $1,700.00 to bail funds and authorities started to get nervous about our plans moving forward. March 20th, 2012. Unions and community members pack the Industrial Relations Committee meeting to give compelling testimony from union members, grandmothers, civil rights leaders, Occupy Atlanta, legal experts the tea party and more. Media coverage is amplified through the novel alliance of the tea party, labor and Occupy. Collective action occurred while leaving the committee hearing with participants putting free speech stickers over their mouths. March 26, 2012. Georgia labor organizes "Welcoming Party" for anti-worker governor Scott Walker (also backed by ALEC) who paid a visit to Georgia on this date. Interesting that Walker came to town while the union killing SB469 was on the agenda in this state. March 29th, 2012. This was the last day of the legislature and last opportunity to pass SB469. A community prayer took place in the morning followed by a press conference that garnered significant media attention. The commitment from our coalition was huge, we had strong numbers from 9:00 am until 12:00 pm midnight. The day/night were chaotic to say the least... The multiple amendments and committee meetings called to discuss SB469 revealed the cracks among the ranks of those pushing the corporate agenda. There was constant communication between tour "inside strategy" which included lobbying our representatives and getting inside information on the status of the bills/votes and the "external strategy" that was mobilizing to commit non-violent civil disobedience if needed to garner national media attention and public backlash against the bill. Over 45 police officers were present with zip ties in the house gallery while our internal allies were furiously organizing representatives against the bill. The discipline and communication between all of our forces was significant and an example of community/labor power focused on a pragmatic and unified goal: killing the bill. The bill was never brought to the house floor before the clock struck 12:00 midnight. We stopped this bill. We stopped some of the most powerful political and social players including Senators Balfour, Hamrick, Cowsert and Tolleson all of whom are members of ALEC. We stopped them in Georgia. Georgia was to be the test case for the rest of the nation. Clock Strikes Midnight, We Killed This Bill. Historic Victory for AT&T Workers!! 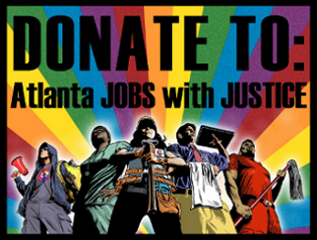 This morning Atlanta Jobs with Justice, Communications Workers of America Local 3204 and Occupy Atlanta united to declare victories. The groups announced a historic victory in preventing over 255 layoffs at AT&T, a result of community and worker pressure. AT&T workers whose jobs were saved by the campaign as well as key organizers will speak out. Following the press conference, the coalition of groups will close the 42 day long tent occupation. AT&T workers had previously received a letter from the company in December 2011 informing them that there would be 740 layoffs in the southeast. AT&T’s announced slashing of good, middle class jobs followed an email graciously thanking its employees for creating record profits for the telecommunications giant while CEO Randall Stevenson was paid out a record $27 million. 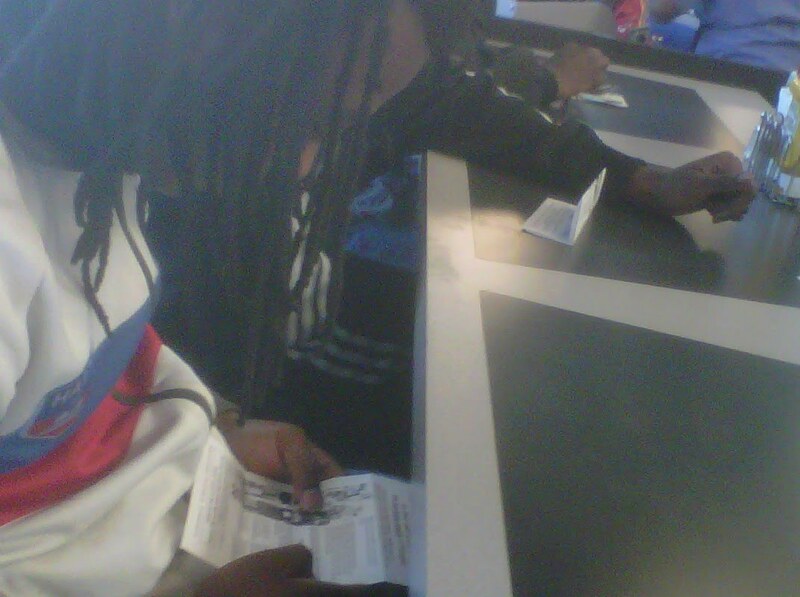 On February 13th, activists staged a sit-in at AT&T’s Atlanta corporate offices in protest to the announced layoffs. The next day, hundreds of community supporters rallied outside the complex and launched over a month long occupation demanding that AT&T stop the layoffs and those scheduled to occur on March 15th. As a result of the coalition’s work, AT&T reduced its announced layoffs by 255 from the original announced 740, and the March 15th layoff numbers were lower than any period in recent history, stopping potentially hundreds more that had been scheduled to occur. During the occupation, the company also cut its CEO Randall Stephenson’s pay by $2 million. This victory at AT&T may be just the start. The organizers hope that the fight back will inspire workers around the country to take direct action against corporate greed and such examples of the continued economic injustice against 99%. The bold series of actions against AT&T’s layoffs and greed, put the 1% on notice- that the days when grossly profitable corporations can carelessly layoff workers and undermine the economic security of hundreds of working families, are over. CWA union members, Jobs with Justice folks and Occupiers are working together to dismantle the encampment. TEAMWORK. Our broad coalition just gave permission to AT&T to reopen their public doors at the 675 W Peachtree St. NW building. The building's doors have been locked since our sit-in on February 13th. Verizon. Verigreedy. National Day of Action. Thursday March 22nd. Please Join Us along with CWA 3204 on Thursday, March 22, 2012 as we stand up against Verizon Wireless! The company continues its assault on middle class jobs despite billions in profits and hundreds of millions paid out in executive compensation. It has forced workers thousands of dollars more for health care, and has slashed the level of benefits. Now, Verizon CEO Lowell McAdams and other top executives refuse to bargain a fair contract with unionized workers. For 6 months, Verizon Wireless workers have been standing up to corporate greed. All they want is a decent middle class life. Support Verizon Wireless workers’ fight for a fair contract this Thursday, March 22, 2012 for Labor’s National Day of Action at Verizon Wireless. Brothers & Sisters, Please wear your Union colors in support of the Verizon Wireless workers! The Atlanta Tea Party has come out against SB 469 a bill that would destroy our first amendment right to free speech as enshrined in the Constitution. But even that hasn’t stopped extreme legislators who are trying to pass this destructive bill. "This is not a right or left issue, it is a right or wrong issue. We may not agree with the all of the politics listed in the scenarios above, but we will defend their right to speak and protest, because this is America. If we destroy the First Amendment, we cease to be a free nation. We believe SB 469 is a gross violation of the First Amendment of the Constitution, and needs to be defeated." The House Industrial Relations Committee will hold a vote on SB 469 TODAY at 2:00 p.m. and we need you to take action. Please click here now to send an email to your Representatives asking them to protect free speech and vote NO on SB 469. Our Basic Rights are Under Attack in Georgia! Stop Free Association with Unions - SB 469 Interferes with union members' right to join and remain members of their union by forcing them to reauthorize their membership every year. SB 469 also requires employers to post notices informing members of how to decertify (get rid of) their union. Criminalize Non Violent Civil Disobedience - SB 469 makes it a crime to "conspire" to commit trespass. This has dire consequences for organizations who organize protests and other forms of non-violent direct action. If enacted during the civil rights movement, many of the leaders of that movement would have been convicted as criminals. This bill is an attack on Georgia's working families and every Georgians civil liberties! WE MUST STOP THIS LEGISLATION. CALL YOUR REPRESENTATIVE & JOIN US IN THIS FIGHT! A few weeks ago Senate Bill 469 was introduced, and it captured the attention of the nation. SB469 aims to kill the power of working people by criminalizing effective protest and undercutting funding to organizations that represent working people. We have recently learned about several other disturbing Senate Bills that seek to further destroy the rights of working Georgians, SB 508 and SB 492. We live in a time of unprecedented wealth disparity. All over the country, unemployment, foreclosures, homelessness, and a bevy of other social concerns have driven thousands into political engagement. We are seeing a totally new section of our population rising up against injustice in their communities, and in many cases reclaiming power. Senate Bill 469, 508, and 492 seeks to dismantle not just people power, but constitutional rights, and human rights as well. SB 469 would make it illegal to picket or protest outside of any non-government building. Those that choose to participate in a nonviolent picket could be fined $1,000 per day, and organizations that supported such actions could be fined $10,000 per day. To make matters worse anyone who is involved with planning civil disobedience actions that result in a criminal trespass charge (this is usually what the charge is for nonviolent sit-ins) would be charged with a high and aggravated misdemeanor punishable up to one year in prison. More troubling is the origins of the Bill. The Bill was introduced by four Georgia Senators, all of whom are members of an organization called the American Legislative Exchange Council (ALEC). To be a member of ALEC lawmakers pay $50 every two years; corporations pay $50,000 per year, and they pay thousands more for every task force they want to be on(there’s nine different task forces). One of the things that happens at these conferences is that law makers and corporations draft model legislation, corporations then pick their favorite drafts and lawmakers go home and introduce the corporate approved legislation. One in five pieces of ALEC drafted legislation gets passed. Senate Bill 469 is the worst kind of ALEC legislation, and a sad example of Georgia lawmakers putting the needs of corporations above the needs of the people. Though out history there have been visionaries who are called to confront, nonviolently, powerful institutions of violence, oppression, and injustice. Such actions may engage us in creative tumult and tension in the process of basic change. We seek opportunities to help reconcile conflict and to facilitate a peaceful and just resolution of conflict. This approach to social change must not be criminalized. If you have been on the fence about coming down and actually camping out at AT$T then this is the day and night to do it: March 14th. 675 W Peachtree St. NE. Steps of the locked down AT$T building. AT$T intends to announce another round of layoffs on March 15th. We plan to encircle the block around AT$T on March 14th to make them think twice... AT$T workers have committed to filling up the block, will you join us? Wednesday 12:00 pm and on, Bring your tents, sleeping bags and blankets if you have them!! If not, we will provide you with a tent and blankets. We need to get as many new campers out as possible! Our goal is to surround the block. There will be banner making throughout the day, come on down! Wednesday 6:00 pm Community Dinner, food will be provided, but feel free to bring a dish of your own. This will be an opportunity for fellowship and to help grow the encampment around AT$T. Yum! Thursday 8-9am, Rush hour rally! Thousands of folks will drive by Camp AT&T during that hour, there’s also a ton of foot traffic. If you can’t sleep over, maybe you can come join us in the morning. Thursday 9am, Breakfast on the steps of AT&T. Come join us for breakfast ya’ll! Maybe even bring something to share! Thursday 1pm- Starving the hungry ghost meditation on the steps of AT$T. These meditations have been really powerful and are non-religious. I must say that they also strike a pretty powerful image for those passing by. Yesterday we had family and friends gather at the 675 W Peachtree AT$T building. Over 90 AT$T employees, community members, CWA members, occupiers, Jobs with Justice folks, Teamsters and others united in fellowship. There were activities for the kids including face painting, arts and crafts, button making, live music, bicycle repair trainings and more. The Communications Workers of America (CWA) provided the home cooking which included some delicious potato salad, burgers, hot dogs and more. We pulled up a truck and put the grill in the truck bed so that the food could be prepared on site. It was beautiful to see families standing together against these devastating proposed layoffs. Each layoff would impact not only the individual employee, but the family that she or he supports and the community in which they inhabit. Unemployment is one of the leading causes of foreclosure. This is precisely why the simple act of gathering in fellowship with a broad swath of not only AT$T employees whose jobs are on the chopping block but the whole community that will be impacted by these proposed job cuts is so important. This community and family strength was highlighted when all of the children gathered together and wrote letters to AT$T explaining why their parents should not be laid off. The children organized together and then ran to the large revolving door at the 675 W Peachtree St. building. (Remember, these doors have been locked for the past 25 days due to the sustained pressure on AT$T from the encampment). The children then left the letters at the revolving door and pleaded for AT$T not to cut the jobs. The occupation of AT$T continues to grow. As does the unity of our community. Our request is simple and humble. Negotiate with the CWA about rescinding all of the 740 proposed job cuts. To date, AT$T has rescinded over 200 of these job cuts. This is a small victory, but considering the amount of money that AT$T makes off of our community we demand the respect of decent jobs and labor relations for our community members. Now. Waffle House Execs Wage War on Their Customers. SB469. Balfour. 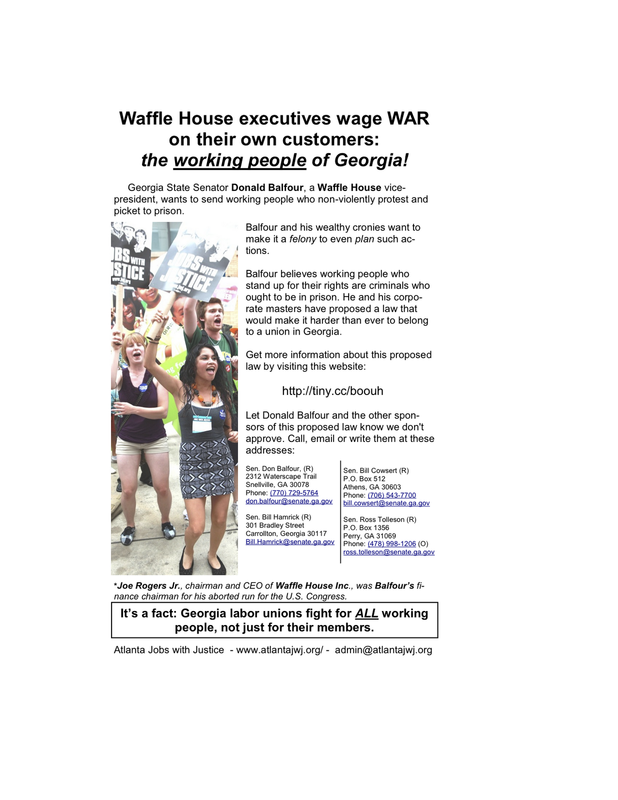 Yesterday morning Atlanta Jobs with Justice and Occupy Atlanta decided to let the good customers of Waffle House know that key executives of the company are trying to shut down 1st amendment rights for Georgians. We hit a number of Waffle House locations in the downtown district and were able to engage hundreds of receptive customers. 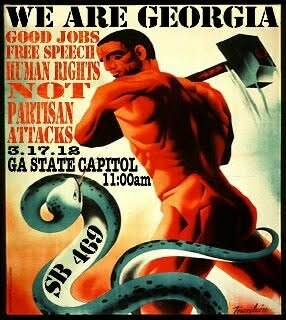 What: Calling all Georgia’s working families, progressive allies, community organizations, and all who care about social and economic justice, free speech, and democracy to stand in opposition to Senate Bill 469 - a politically-driven bill intended to intimidate Georgia's working families. SB 469 would criminalize forms of public pickets for economic justice, effectively de-fund Georgia’s unions, and further penalized political non-violent civil disobedience. In short, the bill is a full scale assault on fundamental human and democratic rights. SB 469 is part of a broad effort to weaken the middle class in order to benefit the 1%. The bill shares characteristics of model legislation from ALEC, an out-of-state, secretive, corporate-funded council that hands state legislators laws designed to benefit CEOs. SB 469 seeks to silence dissent and any opposition to corporate and government policies at a time when millions of working families continue to suffer the hardships and pain of this economic crisis. SB 469 affects us all - Georgia’s 99%. Its time we tell the Georgia Senate to say ‘NO’ to this anti-democratic, anti-labor, anti-freedom bill. Spread the word about this event, far and wide. Let’s build for a HUGE rally on March 5th at 5pm at the Gold Dome (Georgia state capitol building)! It just so happens that dear Don Balfour is the Vice President of Waffle House. We figured that Don Balfour's customer base might be interested to know that the VP of Waffle House is pushing legislation that will shut down free speech rights.